Congratulations to Guatemala on her new president-elect Jimmy Morales! We hope and pray that Jimmy Morales will be a true servant-leader for his country. May truth and justice prevail under his leadership, and may Guatemala flourish in the years ahead. In honor of the election held this past Sunday, we are offering another “BOGO” (Buy One, Get One) sale on Understanding the Guatemalan Patient. For each copy you purchase (up to 10 copies) between now and midnight on Monday, November 2, you will receive another copy FREE! This is a perfect offer for organizations or teams working in Guatemala. No coupon code required, so make your purchase today! This entry was posted in Updates/News and tagged bogo, buy one get one, community healthcare in Latin America, Guatemala, Jimmy Morales, medical interpreters, medical missions, presidential elections, sale, Spanish for healthcare providers, special offer on October 27, 2015 by stevenhammermd. 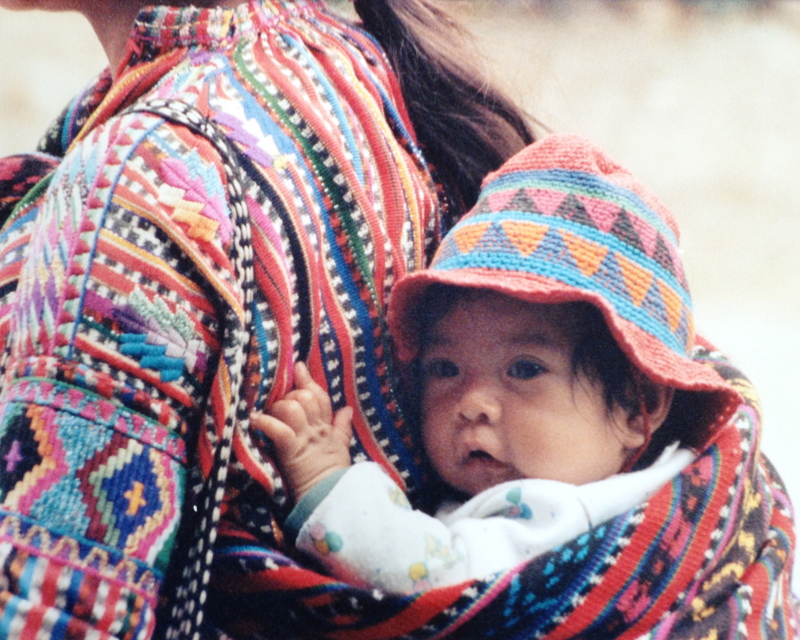 Here’s a Guatemalan baby being carried on his mother’s back. Don’t you love the colorful fabrics? “Aw, Tía Elena, look at that baby!” Emily said. Together, aunt and niece watched the little fellow being carried through the mall. Emily giggled at her aunt’s antics. “Well, that’s what Mamá thought until a doctor kindly told her not to worry about it much. And look at me now!” She gave her cheeks one last playful pat before hauling Emily off to her favorite shoe store. That night, Emily decided to check out Tía Elena’s story. Sure enough, her smartphone delivered the answer: her tía hadn’t made it up! Hey, this Understanding the Guatemalan Patient looks pretty cool! Maybe I could get it for Tía Elena for Christmas. She’d like it. And it would even be small enough to fit in her huge-but-almost-full purse! Emily added the book to her Amazon cart and proceeded to checkout. This entry was posted in Guatemala, Word of the Week and tagged babies, bilingual, cachetes, cheeks in Spanish, Christmas presents, community healthcare in Latin America, folk traditions, fun words, Guatemala, Guatemalan sayings, Latin American culture, Spanish for healthcare providers, Spanish medical interpreters, Spanish-English medical interpreting, translator on October 13, 2015 by stevenhammermd. Now it’s your turn to smile. “Sí, es como amarillo,” you confirm. As you answer a couple of the mother’s questions, you make a mental note to look through that Understanding the Guatemalan Patient tonight. This entry was posted in Word of the Week and tagged amarillo, community healthcare in Latin America, ictericia, jaundice, medical interpretation, midwives serving Hispanics, pediatrics, Spanish for healthcare providers, Spanish medical slang, yellow in Spanish on September 29, 2015 by stevenhammermd.